I’m pretty excited about seeing The Hobbit this weekend but there are more choices than usual to consider before making your ticket purchase. All of the standard choices – IMAX, Lie-Max, regular, 2D or 3D – are here, but now we have to take into account screenings showing the movie at the normal 24 frames-per-second or screenings with the newer, faster 48fps (or HFR/High Frame Rate, to adopt the parlance.) Myself, I want to check out an HFR screening of this film, if only because I’ve heard such bad reactions from critics and the Twitterverse about it (they say the moving images are just too clear and too smooth, almost like watching video instead of film), I fear this may be the last chance to see it (or future movies!) in this format. Also, because reactions have been so split, I definitely want to check it out for myself to see how I feel about it before it potentially goes away. I hope I like HFR and the movie, and seeing as how The Hobbit is one of the favorite books of my youth I hope I love it, but after all the disappointing prequels and sequels of late, my expectations are tempered. So who’s seeing The Hobbit this weekend? And what format do you plan on seeing it in? I watched it this morning. Amazing. i’m happy to hear that, Maesonic! i’ve put a moratorium on reviews after reading such harsh criticism of The Hobbit, and decided to just go in without expectations (as much as that’s possible, anyway.) should be seeing it Saturday night! so how did you see it? 2D? IMAX? HFR? I screened the 3D 28FPS. Even with my lazy eye, the 3D was visable going into the background, so props to them for that. My shades are gold? excellent! they will go well in my special 3D glasses collection. (working at a movie theater has its perks). and, yes: these Shades are preciousSSss. To cut down the options, I believe 3D is only available in the 48fps version. Oddly, given that the global premiere was just “over the ditch” from where I live in Australia, we don’t get to see it until Dec 26. My preference would be a 2D 48fps screening. I’ll just have to see what my local cinema is showing it in. i’m surprised Australia doesn’t have it already, Jim! weird. i’m going to try and see the 48fps showing, too. crossing my fingers it doesn’t look as bad as i’ve been hearing. i’m one of the ones who like a little “smoothing” on my tv shows and blu-rays, so maybe i’ll really dig it. i’ll have to put up a quick review once i see it. lol. contrary to popular belief, sometimes criticism are not actually valid. why? look at star wars. most people said that the prequel was bad but i dont think so. why? its because i love everything about star wars. except those christmas thingy and jar jar. It’s going to half kill me, but we’re probably going to have to wait until next Friday—the theater nearest my house has morning matinees, so we’re going to the earliest possible 2D showing. I’m getting too old and cranky to spend money on babysitters and tickets just to hear the audience instead of the movie. Plus, this way, I can see it again right afterwards, if I want, before I have to pick up the kids from school! well, since it’s The Hobbit, at least you won’t be afraid of spoilers waiting that extra week to see it, Sarah W! and thanks for the Dwarf ID chart – even being familiar with all the characters in the story, i can’t keep all of their names straight in my head. I have no idea when Ill see it. A housemate is going to see it soon and Im tempted to join him but I dont know if Ill have time that day yet. And going alone is not tempting when I know there will be a lots of other people. Otherwise I enjoy seeing movies shortly before they stop showing them cause there are less people in audience. this one might be fun to see with a lot of other pumped-up moviegoers and Tolkien-fanactics, Maryz! if you see it with your buddy soon let us know. I’m with Mombot here. Since when did movies get so complicated? Sure, there’s the 2D or 3D option, but the decent IMAX is a 2.5 hour trip away. (max) The other IMAX is just okay, nothing super about it. And the idea of having to choose which FPS is entirely new to me. yeah, that people have to know the difference between IMAX and the “IMAX Experience” is totally lame to me, ROM!. they should totally have different names for those things. and the difference between 24fps and 48fps is supposedly pretty significant, but not necessarily for the better. i’ll know more when i see the film at 48fps tonight! I got myself ready for the Hobbit by heading to my local AMC theater on Saturday where they were showing all 3 Lord of the rings movies, extended versions, back to back to back, for 13 hours. Loved doing that but I don’t think I’m going to spend 13 hours (with an hour break between movies) again, at least not until they show all 6 Star Wars movies before the 7th comes out, and you know they’ll do it! I plan on seeing the Hobbit in normal 2D, 24FPS format, which is my grandpop watched them, it”s how my pop watched them and it’s how I’ll watch them darn it! and, like you, most of my friends are planning to see it in 24fps. but i’m just too curious! have to check out the 48fps. I think this tells you how long it’s been since I’ve been to a movie theater: When in the world did HFR roll around? I’ve never even heard of it up until today. Is it a recent thing or do I really need to go see a movie again that badly? you’ll be happy to know this is the first big release in the format, Alexander. James Cameron and Peter Jackson have been championing HFR for the past year or so, but theater owners and viewers remain skeptical. we’ll see! read The Hobbit before tackling LOTR, dj – it’s a quick read and will get you all into Middle-earth. and congrats on completing your undergrad studies! I’m just like mombot… I just want to go see a movie, then everyone keeps saying we have to see it in 3d or IMAX or all that nonsense. Truth is I’ve never really been able to watch a 3d movie, if their is any light at all, even just barely.. I can’t see it and my eyes are drawn to it, instead of looking through the glasses. But thanks to one of my jobs( many jobs, all so I can buy the house I’m in one day) I have an 83 inch tv, and 7.1 surround sound. So even if I don’t see a movie in theaters, I basically have a theater at home. My tv was a gift from my boss for about 600 dollars.. Since I set up his 120 inch tv at his house.. I can’t get the effect of a 3D movie either. See my comment below. I know a lot of people who are also half blind and can’t see those movies.. I live 15 minutes from sandy hook elementary.. Today may have been one of my worst days ever..
so sorry to hear that, Satoshieyes. i was shocked when i saw that on the news. (still shocked, actually.) hard to even process just how horrifying that is. WOW. an 83″ television!!!? i’d probably never watch theaters at home again with that tv, Satoshieyes! heheh. i’d love to play videogames on that thing. and while i generally see the big fx movies at the theater on the largest screen possible and 3D if available, if the story’s good, all that shouldn’t matter. most of my favorite movies came out before IMAX and modern 3D! agreed: Martin Freeman is too cool, GG11; perfect casting. hope you have fun when you see it! I might try and go see it Sunday or Monday with some friends that coming home from college for winter break. sweet! let us know what you thought of it and what format you saw it in, 52pickup. I don’t really have any interest in seeing the movies. It’s mostly because I’ve not read any of the books and only seen parts of any of the movies. 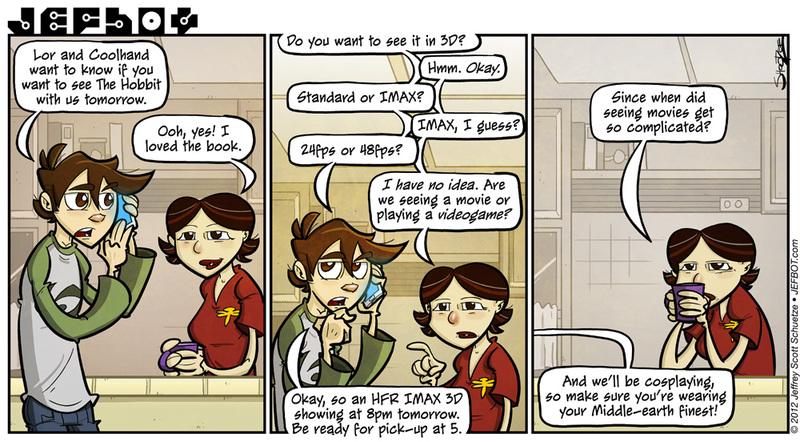 As far as the different movie formats go, I’d prefer to see a movie without any of the fancy extras like 3D. It’s mostly because they have yet to come out with glasses friendly 3D glasses and I’d rather just watch the movie without them than end up with a sore neck or a headache. i can see how watching a nearly-3-hour movie would not be appealing to someone who isn’t into the books or previous movies, Fijiman! if you like fantasy at all, however, you should definitely give ’em a try (the books and/or the movies) some day. I’ll get around to reading the books sooner or later, but not right now. Same with the movies. I agree with your mom!!! I’m over the 3D! Great strip! heh. sounds like a lot of people are over 3D now, FunnyShaffer! The bot and coolhand have committed to the HFR 3D. It may be amazing! Then, again it may become a comedy number! Either way should be good after loading up on the Hobbit menu at Denny’s! Oh, yes, there will be 2nd dinner…maybe a 3rd at America’s Diner! and 2nd or 3rd dessert for that matter, coolhand! can’t wait for the movie – see you in a few hours. … does Coolhand know about elevensees? luncheon? afternoon tea? Supper!?! i think he’ll need some rabbit stew and po-tay-toes to get into the proper mood as well, Maesonic. Cinemark pretty much has a monopoly on movie theaters in my town, so my options are limited to either 2D or 3D. Nonetheless, I loved the book, and I can’t wait to see the movie! Life of Pi was good, DAS – i didn’t love the whole thing, but man, the visuals are spectacular – definitely worth seeing on the big screen! it has stuck in my mind more than i thought it would, as the ending raises lots of questions worth pondering. will definitely revisit when it comes to the small screen. it should be pretty incredible – HFR or not – on an IMAX screen, Oz! let us know what you think. Other than some silliness at the begenning of the movie I thought it was pretty good. It took a little bit to get used to the 48 fps, but once you did it was pretty cool. Overall the movie was well done (although 1 scene does add weight to the whole “How LofR Should have ended” meme). Dear Mombot, I would have to say, overall, in a compounding of events that have conspired to complicate movies, was giving birth. Drum roll riff please…. >dead silence< Okay, well. . . . . Given that geeks are utter fanatics about movies, and are in some mentalities perceptive about Que formation, mathematics over social interaction matrices, unconscious applications of sociology via Asimov's Foundation trilogies. It's about as complicated as it is in realizing that only two brain cells regulate the breathing process. That and Lucas sold to Disney the Star Wars franchise. So, all in all, while congratulations on an interesting son, I have no definitive answer to give to you, just mere farce. it may be a question without an answer, W.D. Pat, especially as theaters try and pile on more and more gimmicks to compete with increasingly larger screens at home, which in turn make ticket prices higher. maybe someday moviegoing will become less complicated? one can hope. How do I get my gravatar to work here. I’ve got it on one site, and that’s it. . .
i’m sure there are pirated versions of the movie out there already, W.D. Pat, but yes – in a sense, all these “bells and whistles” in theaters are to stem piracy and home viewing by trying to offer an experience one can’t get in the comfort of one’s domicile. at least not yet. you can be sure it won’t be long before HFR comes to the home screen now. and to get a gravatar to work, just make sure which email address you have attached to your gravatar (at gravatar.com) and then put that same address into the “email” field when creating a comment. should work. I agree with you on the domicile part. There is nothing like being a part of an audience. And there is nothing like having an audience. Don’t know why, Jeff, but in this strip you remind me of Steve from American Dad. Do you ever watch that show? Woot woot! The Hobbit! There is a smally chance we might go see it for my birthday tomorrow, but we still have a ton to do to get ready to leave for our big trip to Europe on Wed. So I’m not sure if we will make it or not. I totally want to see pics of Mombot in Hobbit cosplay if this is one of the truly autobiographical strips. Who are *you* going to dress as? I’m sure I will at least wear The One Ring on a chain, but I don’t know if I’ll do anything else. and: wow. wednesday!!? hmmm… hard choice. well, if you don’t see The Hobbit before then, maybe you can catch it during your vacation. and i’m sure it’ll still be here when you get back! and with the increasing price of movie tickets, i can see how that would be a problem, JR. they really need to bring those down (and the price of movie snacks) so it’s easier for a night at the movies. I’m waiting afew weeks till the popularity dies down to see the film, but I am looking forward to seeing it. When it comes to format my friends wanna see it in IMAX, but if I don’t go with my friends I’d see it in regular format. Movies are expensive enough to see out in the theatres. very true, Michael Hunt. with movie snacks it’s hard to get out of a movie theater for under $25 these days! crazy. so what’d you think of the movie? and did you see it in 2D/3D/IMAX/HFR? The old red and blue 3D glasses made me dizzy and gave me headaches when I used them. I can only see with one eye at a time and the different colors of those glasses forced my eyes to alternate from one to the other. Fortunately, the 3D effect is handled differently with the more modern glasses but I still feel I don’t get the full effect that a person with normal vision would. I can still judge distances very well despite my “half blindness”. I simply look for clues such as apparent size, crispness of colors and object image clarity. I also turn the top, bottom and sides of my field of view into an imaginary ruler leading to objects. Once a friend of mine injured one of his eyes and had trouble judging distances as a result. I tried to coach him on these procedures but he had difficulty understanding. Then I started wondering if I’ve been using these procedures for so long that I’ve forgotten how complicated they actually are. sounds like you’re doing a lot of processing that a lot of us take for granted, Rainey. and those red and blue glasses used to give me headaches, too. i used to play some games on my NES that used those and it was a pain. the new 3D tech doesn’t give me headaches but sometimes it dims the picture a lot. i hear that’s because a lot of theaters and their projectionists sometimes don’t know how to correctly project a 3D movie. ugh. I saw it at midnight at a local theater, very good, very true to the book. I have to say I think it should be required that all 3D movies now be shown in 48 fps. Though I still kinda think I’d rather have seen it in 2D, hfr gave it a smooth feel and left me with almost no headache throughout the movie. I might be a little late to the party, but if you do decide to watch it in 3D, watch it in 24fps. The format doesn’t make much difference, but watching it at 48 in 3D made a lot of people sick because, like you said, it was too real. The higher the frame rate, the smoother the effects, but the more disorienting it gets as your brain tries to process everything at once. I’ve never been able to get really dizzy, but I had a few moments where I started to feel a bit queasy. Just my two late cents. I really liked it even if the padding was a bit too… insistent. Seriously, what was the deal with the songs ? So, Bot, seen any differences between 24 fps and 48 fps ? Jeff, I had to go through the “Hobbit” format decision tree myself yesterday. Plus, as I live in Mexico, I had to add a step: dubbed or subtitled? My wife (Mexican, but with excellent English) and I ended up at the 2-D, subtitled, normal frame rate version. It’s a good movie, and in terms of emotional depth, bears the same relationship to the LOTR movies as we see in the books. As others have mentioned, there seemed to be some padding (one too many aerial panoramic shots of our heroes traipsing over the New Zealand Alps), but it’s solid. Fans will not be disappointed, and it’s a good introduction to Tolkein’s world for newbies. Did you notice that Andy Serkis was also the second-unit director? I’m hesitant to see most movies in 3D. Very few of them are filmed in 3D, and doing it post-production usually turns out poorly. Y’know, the kind of 90s comic book headache 3D like we saw in the re-release of Nightmare Before Christmas. The Avengers was a rare exception, but it had years of active anticipation to measure up against. Pharmacy school forbids me to see it until Christmas break, so sometime next week, I imagine. JEFBOT - Did you see the Hobbit?